Lack of money has been a dominant issue running through all of my life, but since learning of the Law of Attraction and especially Abraham-Hicks teachings, I have come to a point where I now know that all my needs are, and will always be, met. I am now doing my best to focus, as much as I can, on how I want it to be, rather than how it has been in my past. And I know that if I continue to focus on all the abundance of love, peace, joy and beauty that are in my life, then an abundance of money will follow. Continuing to tell stories of shortage only continues to contradict your desire for abundance, and you cannot have it both ways: you cannot focus upon unwanted and receive wanted. You cannot focus upon stories about money that make you feel uncomfortable and allow into your experience what make you feel comfortable. A different story will bring different results. Dollars aren't the root of happiness, but they are not the root of evil either. They are the result of how somebody lines up the Energy. Do not let others set the standard about how much money you should have, or about what you should do with it, for you are the only one who could ever accurately define that. Feel appreciation for those who provide examples of Well-Being. How would you know that prosperity was possible if there wasn't some evidence of prosperity around you? It's all part of this contrast that helps you to sharpen your desire. If you are feeling a shortage of time or money, your best effort would be to focus upon better-feeling thoughts, and do more things that make you feel good. If you believe that you must work hard in order to deserve the money that comes to you, then money cannot come to you unless you work hard. Financial success, or any other kind of success, does not require hard work. It does require alignment of thought. If your dominant intent is to feel joy while you are doing the work, your triad of intentions - freedom, growth and joy - will come quickly and easily into alignment. See your 'career' as one of creating a joyful life experience. Make a 'career' of living a happy life rather than trying to find work that will produce enough income that you can do things with your money that will then make you happy. When feeling happy is of paramount importance to you - and what you do for a living makes you happy- you have found the best of all combinations. Many tell us that they are so busy making their money that they do not have time to enjoy it... for when you rely on your action to create, often you are too tired to enjoy your creation. Once you not only understand the power of your thought, but you deliberately direct this powerful tool in the direction of things that you desire, then you will discover that the action part of your life is the way you enjoy what you have created through your thought. 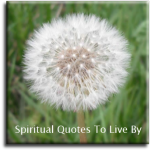 Some say that you should not want money at all because the desire for money is materialistic and not spiritual. But we want you to remember that you are here in this very physical world where Spirit has materialized. You cannot separate yourself from the aspect of yourself that is spiritual, and while you are here in these bodies, you cannot separate yourselves from that which is physical or material. All the magnificent things of a physical nature that are surrounding you are Spiritual in nature. The idea of success for most people, revolves around money or the acquisition of property or other possessions, but we consider a state of joy as the greatest achievement of success. And while the attainment of money and wonderful possessions certainly can enhance your state of joy, the achievement of a good-feeling physical body is by far the greatest factor for maintaining a continuing state of joy and Well-Being. There is no better way to earn money than to do the things that you love to do. Money can flow into your experience through endless avenues. It is not the choice of the craft that limits the money that flows - but only your attitude toward money. What-is has no bearing on what is coming unless you are continually regurgitating the story of what is. By thinking and speaking more of how you really want your life to be, you allow what you are currently living to be the jumping-off place for so much more. But if you speak predominantly of what-is, then you still jump off, but you jump off into more of the same. You cannot receive vibrationally something that you are not a vibrational match to. And so, bless those who are finding abundance. 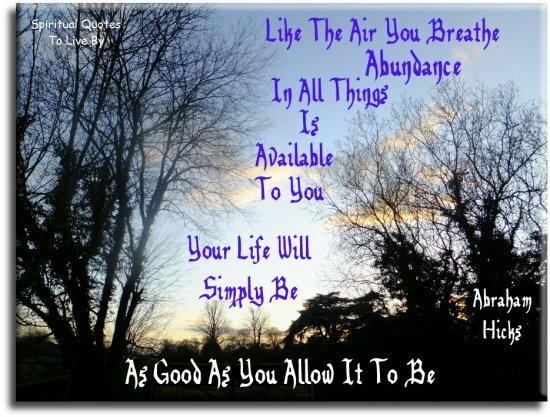 And in your blessing of them and their abundance, you will become abundant too.